The Disney Channel is bringing back the classic Win, Lose or Draw game show but this time they are adding a Disney twist to the popular game. 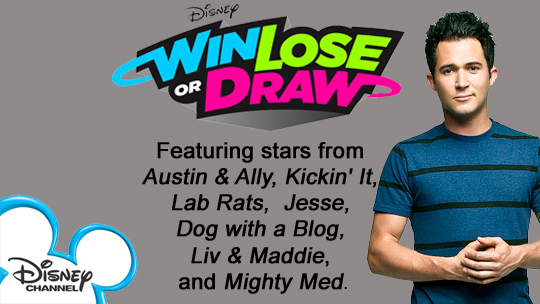 The Disney version of Win, Lose or Draw will have Disney Channel stars competing in the game show. In the 2014 version of the game, kids will be paired with Disney cast members of popular shows such as Austin & Ally, Kickin’ It, Lab Rats, Jesse, Dog with a Blog, Liv & Maddie, and Mighty Med. The show will put one star up against another as they try to help out the kids they are paired with and win the game. This rapid-fire competition is hosted by Justin Willman. The kids and the star they are paired with will have to guess and draw their way to winning the prizes. There are also some physical challenges that need to be completed as well as some comedy from the host and the stars. Since the game is for kids, the audience will be filled with kids and the show is casting kids 12 to 17 to be in the audience and in the studio with their favorite Disney Channel stars. If you are interested in being cast for the audience, actually, you will need to request tickets. The tickets are free but you will need to have a parent or guardian fill out the ticket request form. Only kids will be on camera during filming of the show. Parents will have a separate area where they can wait. You can click here to get your show tickets. You must be at least 12 years old to get on the show. Disney brings back the classic game show and pits Disney Channel stars against one another! Two teams of kid contestants are paired with cast members from some of their favorite Disney Channel shows in a fun game of drawing and guessing for prizes! The show is filmed in Los Angeles, so please only apply to be in the audience and attend a filming if you live in the Los Angeles area or are planning on visiting Los Angeles. Even though the tickets are free, there may be a parking fee and those attending will need to cover their own travel and parking costs. The show is filmed at CBS Studios which is located at 4024 Radford Ave. in Studio City, CA 91604. Want more info on Disney Win Lose or Draw…. well you can watch the game show geek talk about the show in this video. Also, stay tuned for any audition and casting call information for the show and maybe a chance to get on Win, Lose or Draw! Me and my sister would love to be on win lose or draw. We love art and we love the show so if we could be on it, we would be so happy. If we could go on, we would love 2 people from jessie. We do duets together every day and we sing together. We are twins and that is all we have to say. I would also like to be in Win, Lose or Draw with my best friend, Erik. Hi I’m Emilia and I would love to be on TV. Hi I’m Allison and I would love to be on win lose or draw. I am a very challenging person and I face danger head on. Me and my friend Alexus would love to be on it together. Please consider us, Thank you so much please consider us. Hi, I am Mariam. I would love to be Win,Lose,Or Draw. It would be a dream come true! If I went, I would go with my brother because I love him! I’m Ashton Wagner, I’m 10 years old and I can sing and dance. Hi I would really like to be on win lose or draw. I want to get on this for my sister, it is her birthday and I am trying to surprise her I live in Namibia. I would really like to be on win lose or draw with my sister. My name is yahia khaiwi. I am in Lebanon, Asia. I really would like to come to win lose or draw but I am too far and can’t afford an airplane ticket to L.A. I would love to be on it. I haven’t decided who to bring but if I go on the show the few days before that I will choose. Hi I’m Frankie and I would love to be on the show. Me and my brother Malachi are dancers and I love rapping and he loves singing. My name is Alexandra and Win Lose or Draw is my favorite show next to Every witch Way. I would love to be on the show with my best friend. I really wanna be in this show because I can tell people at my school that I was in a Disney channel TV show. I’m a really big fan. My friend Sarah and I would me great. We are band buds. I met her in sixth grade. We both play the oboe. We play many sports and I’m 5’1″ in height, 100 lbs and I have blonde hair with blue eyes. Sarah is 4’11” in height, 90 weight and she also has blonde hair and blue eyes. We are big fans. She turns 13 in November 2014 and I turn 14 in November 2014. We live in groveport/Columbus Ohio. Hello me and my friend would really like to be on the show and I don’t care who I’m with, I really would like to be on tv. So get back to me if you can please. I’m 10 years old and I’m from BC Canada. Thank you. Hi, My friend and I would LOVE to be on win lose or draw. I would really like to be on the show with anybody but I also really would like to have the experience to be on TV. I have really long red hair and I’m from BC, Canada. I am 10 years old, so please get back to me to let me know if I could be on the show. Thank you. I will love to be on this show and meet the actress and actors. I would love to be on this show and I would be perfect because I have a very funny personality. I love puzzles and all of that cool stuff. I even play charades with my family sometimes. I also think it would be an amazing experience. I am 11 and I love playing volleyball, softball, and singing. I would love to come on this show and be a part of it, meet the stars, but most of all Cameron Boyce. I’m one of his biggest fans. I have pics and posters of him. I would love to join in, to take part and feel what it feels like to be when you are with stars. Please make my dream come true, it’s to be on win lose or draw with Cameron Boyce and to be happy, please get back to me soon, Lauren. Please, please, please pick me to be on win lose or draw. I love this show so much. my mom practically has to pull me to focus on everything else. Lauren, you can be in Win, Lose or Draw. Reply to Max: Even if you lose, that’s fine. Just tell your parents you did an awesome job. Hi my name is Kyla and I love acting and singing. I think I will be great for this because I am confident and having lots of fun is what I like to do. I think it would be fun because we are drawing and showing team work and that what it is all about. It is not about winning, you just have to be a good sport and support other teammates, don’t make fun of them. Hi, I am Kennedy Kovara, I am 13 and love singing and sports. This show is one of my favorite shows and I would love to be on it. thank you for your time I apreciate it. Hiya, I’m Seaira, A 12 year old who loves fashion, passion and singing (la la la), I love to rap Nicki Minaj’s Superbass song but I want to do something FUN in my life so I thought ACTING would be great!! Btw, I LOVE Jessie, It’s my Fave but any show is good for me as long as it’s ABC Family or Disney I will be great!! Thank You for your Time. Hello!I love your show. I would love to be on your show. I’m a great artist, I love to draw. I need to know how much it cost?Looking forward to hear from you!BYE!!! Hi I would like to be on Win, Lose or draw!! Hi my name is Jaclyn peacher and I am a Loving, caring, Sweet, Fun, Funny, person. I am not a sore loser never have been and never will be. If I get on the show and I don’t win I would not be mad or anything because I got to have a great experience. My parents support me and still will and we would be there right on time anywhere any place and anytime. I love Drawing I do it all the time. So that’s why I would be great to be on this show. Plus I’m a really good actor. I love to meet new people all the time and I never judge. I’m in really good shape healthy and everything. Hobbies: Writing, Drawing, Art, (all kinds) Acting, Basketball. Hello I’m Sophie and I think that i would be a really could candidate for this show. This is so because I am very competitive and I love to have fun. I am 14 years old and I live in Fl. I was born on June 21, 1999. I am very athletic and willing to take challenges. Thanks you. I really want to be on win lose or draw because it could be fun and I like drawing. I would love to be on tv please, pretty please with a drawing of a cherry on top. Anthony, you can also be in Win, Lose or Draw. I would love to be on win lose or draw because I can draw really good and I really want to be on TV. I’ve always wanted to be an actress. Could I please go on win lose or draw? I think that you might have a chance but you shouldn’t sound so conceited doing it. Hello my name is Jacy and I would like to be on win lose or draw. I would like to have fun and experience the chance to be on TV with stars. Please keep an open mind on letting me on the show. thank you. You sound so sweet I would put you on the show in a second. Hi my name is Rania , it would be so cool if I can get on this show, I love to draw and I am actually good at it. I heard about it and was really interested. I am 13 and a little bit skinny, but is that important? No I don’t think so, so please let me have the chance to be on the show at least one time. PS: I am in Philadelphia. My friend and I would enjoy to be on this show, we have ac very awesome personality and we do many things together. I’m mandy and I will love to audition for this game show, email me. espero que me acepten cuanto lo sueño deverda porfabor asta que boy ha llorar. Hello my name is savannah I would love to be in Win, Lose or Draw. OH forget that just PUT ME ON TV. I WAS BORN TO BE ON IT. MY MOM AND DAD SUPPORT ME AND ALSO MY SIS NEEDS TO BE ON TV TOO. HER NAME IS Destiney, SHE IS 12 BUT PLZZZZZZ PUT US ON TV. WE DON’T EVEN CARE WHICH SHOW BUT MAKE IT HAPPEN IN A WEEK OR SO. I want to be on win lose or draw because it would be a huge opportunity to hang out with the people I love to watch everyday and get to meet the the real them. and p.s. I am from coos county, Oregon. care what show you put me on! As you can already see, I am super fun to hang out with! 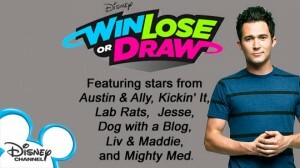 But I think Austin and Ally and win lose or draw sound fun. best show and I would like to be on it. I can be on one of the Disney channel shows. I really like all of the the shows and I am from Fayetteville, NC. You can be in Win, Lose or Draw, but are you going to win a lot of prizes?